Es fundamental lograr el conocimiento de los diversos intervalos y las estructuras de los Acordes para poder tener mayor amplitud y versatilidad en el dominio armónico del instrumento. 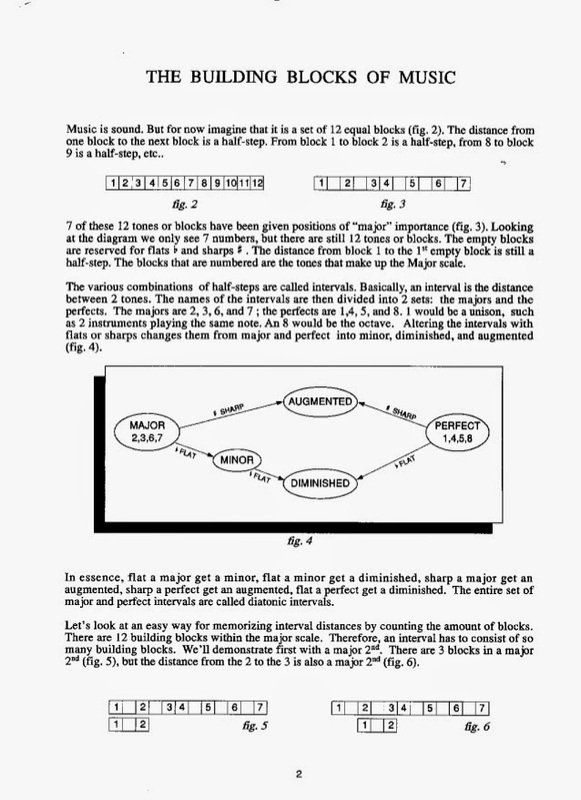 A mode is a new scale derived from the notes of another scale. 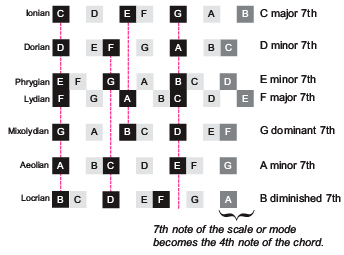 A mode begins and ends on a note that belongs to the original scale and has all the same notes as the scale from which it is derived. The difference is simply the beginning note. 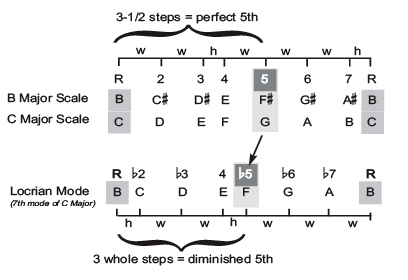 Modes have been given names depending on what note of the original scale the mode begins on. The names come from locales around ancient Greece. The first mode which begins on the first note of the scale and is called Ionian (this is identical to the Major scale). The Dorian mode begins on the second note, and so on. Although these modes share the same notes as the scale from which they are derived, when played they have subtly different sounds. Soloists often base their improvisations on modes, and change from one mode to another as the chords change in a song. 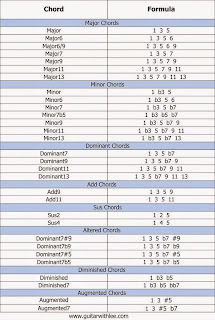 The different tonal qualities of the modes is a function of the relative spacing of the notes from the beginning note. 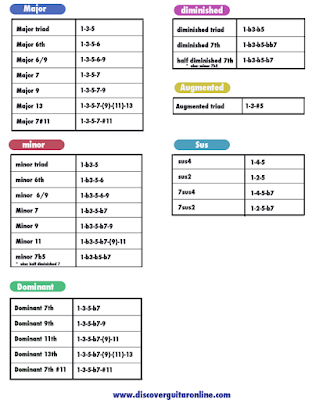 The diagram below shows the names of the modes of major scales, the notes they begin on, and the spacing of notes in the mode. 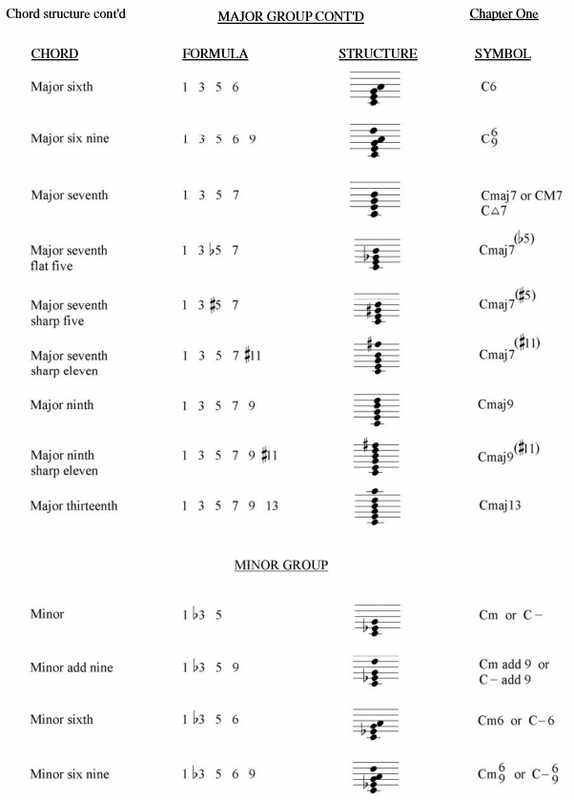 This example shows the modes of C major. However, the spacing between notes and the mode names are the same for all the major keys. The Natural Minor Scale Within the major scale is a mode that is so popular that it has risen to the status of a full fledged scale. 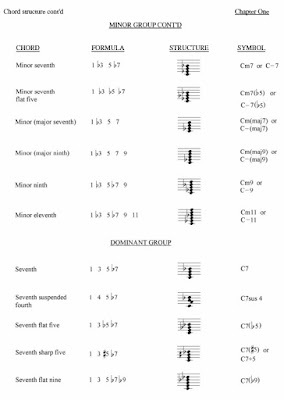 The sixth mode of the major scale is the Aeolian mode but it is better know as the Natural Minor Scale. 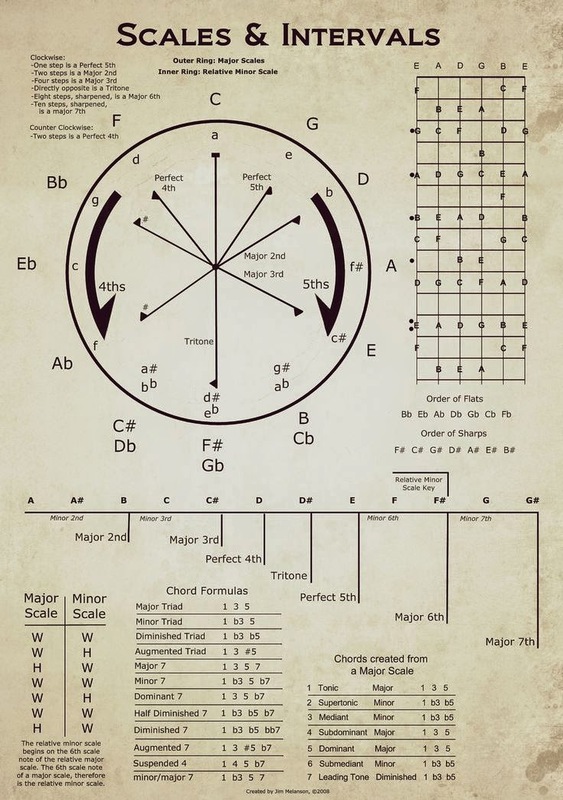 This is the most common of all the minor scales and is used in every aspect of Western music (that is music of western culture not as in country-western). 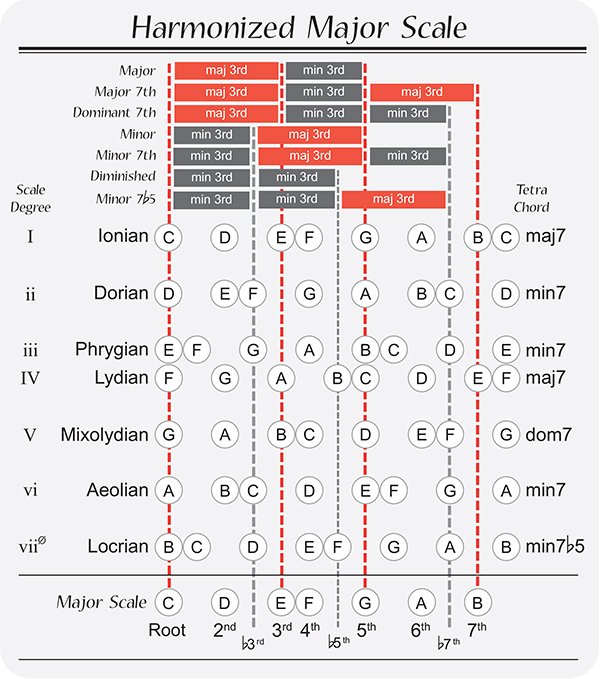 The Natural Minor scale is actually the same as the Aeolian Mode. 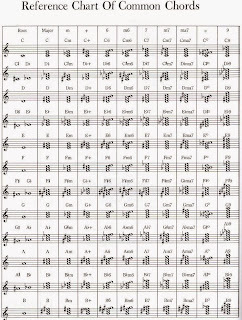 They share the same notes as the Major scale from which they are derived. A chord can be any number (greater than one) of notes played simultaneously. The basic chord is the three-note triad. It normally consists of a root note and the third and fifth note of the mode or scale that it is derived from (see Scales). However, other notes are often added to the basic triad to create more interesting harmonies. Many chords consist of four notes with the forth note being the seventh note of the scale or mode. Chords that have this seventh note included are called seventh chords. Seventh chords are written like this: Cmaj7, Dm7, G7 (Gdom7). Sometimes, the sixth note of the scale will be added instead of the seventh. As you might guess, this chord is called a sixth chord, i.e., C6, Fm6. The addition of the 7th note of a scale to a triad chord adds more complexity to the harmony of a piece of music. These four-note chords are very important to jazz and rock. The addition of the 7th note of the scale to the chord derived from the fifth mode creates one of the most special chords in Western music. This four-note chord that is derived from the Mixolydian mode is called a dominant 7th chord. This chord is essential to the sound of jazz, rock, and blues. The dominant 7th chord creates a unique feeling of tension in a chord progression that is nicely resolved when it is followed by the chord based on the Ionian mode. Extended Chords Sometimes notes above the first octave of the scale are added to chords to give them a larger sound. Chords with these notes are called extended chords. 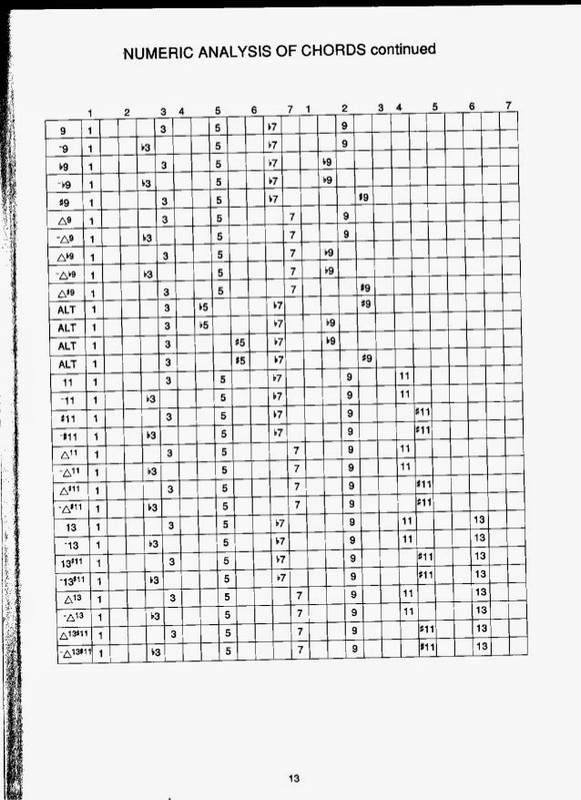 Chords with extensions are named according to their highest scale degree, e.g., Cmaj13 (as in the example below). Chords are named according to their root note and the intervals between the notes that make up the chord. 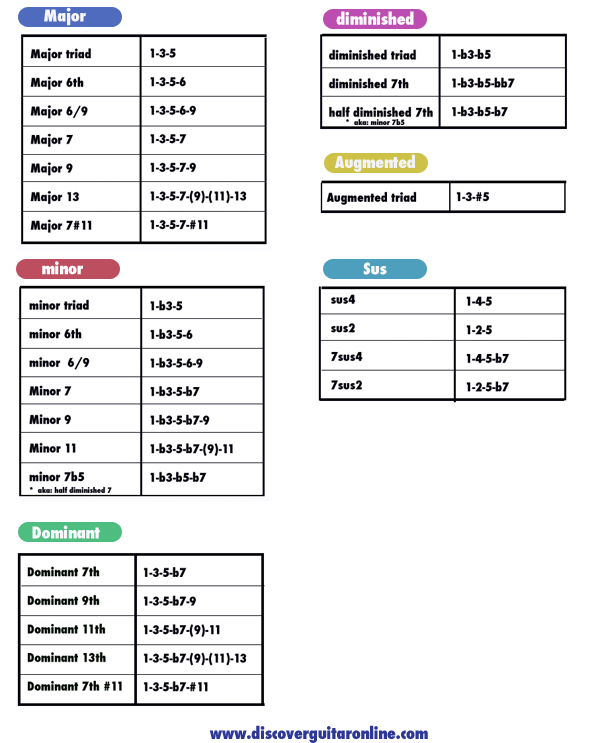 Chords of a diatonic major scale fall into four types: major, minor, dominant, and diminished. Chord names also depend on what notes are in them. 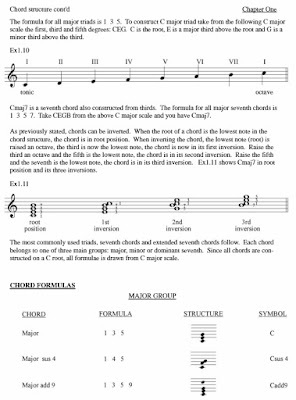 To understand the names, we must first know how chords are constructed. 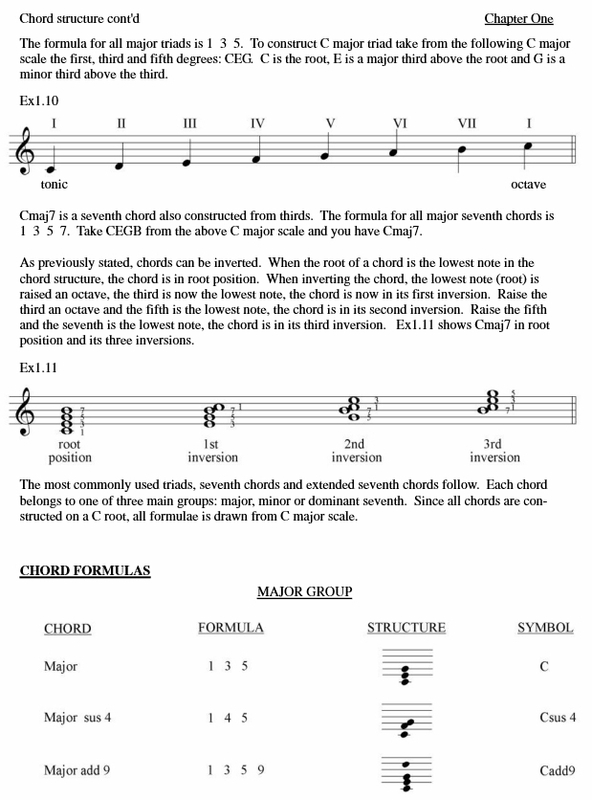 Chord Construction A chord is simply a group of notes sounded simultaneously. A group of three notes is called a triad. Commonly, triads are made of the first, third, and fifth notes of a scale or mode. Other notes can be added, but in the diatonic system any note added to a triad must belong to the key. Major Chord For example, the C major triad is made up of C, E, and G. Observe that the interval from C to E is a major third (2 steps) and the interval from E to G is a minor third (1Þ steps). This arrangement of intervals produces a major chord. When we add the seventh note of the major scale, we create a four-note chord known as a major 7th. 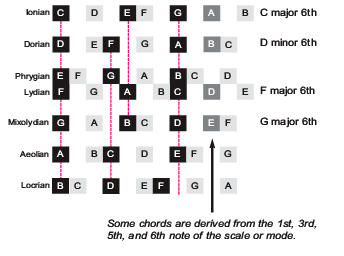 Even though the notes of the Lydian mode (beginning on the fourth note of the major scale) are spaced differently than the major scale, its 1st, 3rd, 5th, and 7th notes produce a major 7th chord. The second note in the C major scale is D from which the Dorian mode is derived. When we choose the first, third, and fifth notes of this mode we get a different-sounding chord from the major. Here the interval from D to F is a minor third (1Þ steps) and the interval from F to A is a major third (2 steps). This arrangement of intervals produces a minor chord. When we add the seventh note of the mode, we create a four-note chord known as a minor 7th. 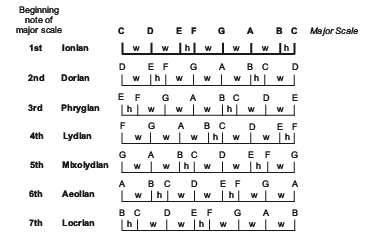 The other modes in the diatonic scale that produce a minor chord are Phrygian and Aeolian. In the key of C major they look like this. The Aeolian mode is also known as the natural minor scale. The Aeolian mode is also referred to as the relative minor key of the major key from which it is derived. In the example below, the A Aeolian mode is the natural minor scale relative to C major scale. Dominant Chord The fifth note of a diatonic scale begins the Mixolydian mode. When we choose the 1st, 3rd, 5th notes of this mode, it produces a dominant chord. A dominant chord, whether it has three, four, or five notes, creates harmonic tension when played as part of a chord progression. The dominant triad is simply a major chord since the distance from its root and second note is a major 3rd. However, when the 7th note of the mode is added to the chord, it produces another minor 3rd interval between the third and fourth notes. These four notes combine to produce a chord which sounds slightly dissonate. This dissonance creates tension in a piece of music which is released by moving to another chord, usually the tonic chord. 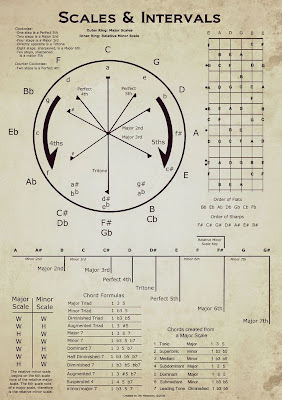 This phenomenon will be discussed further in the Chord Progression Map section of this guide. When we choose the 1st, 3rd, 5th, and 7th notes of the Mixolydian mode to create a chord, we produce a chord known as a dominant 7th. The dominant seventh chord differs from the major seventh chord by the interval between the 3rd and 4th notes of the chord. The last note of the diatonic scale begins the Locrian mode. When we choose the 1st, 3rd, and 5th notes of this mode we produce an interesting triad known as a diminished chord. In the key of C major the Locrian mode begins on B. Here the interval between the 1st and 3rd notes is a minor third and the interval from the 3rd to the 5th is also a minor third. When we add the 7th note of the Locrian mode to the chord, the interval between the 5th and 7th notes is a major third (2 steps). This chord is sometimes called a half-diminished seventh. 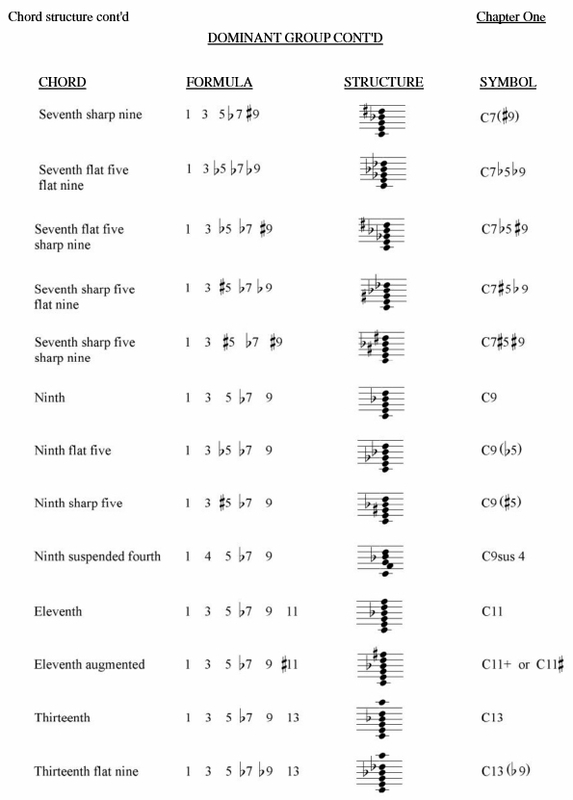 However, since the first interval is a minor third, it is also known as a minor seventh flat-five chord. When the chord has B in the root, it can be written Bm7b5. This chord is almost a regular minor seventh chord, except that the third note of the chord is a half-step lower than it would be normally. 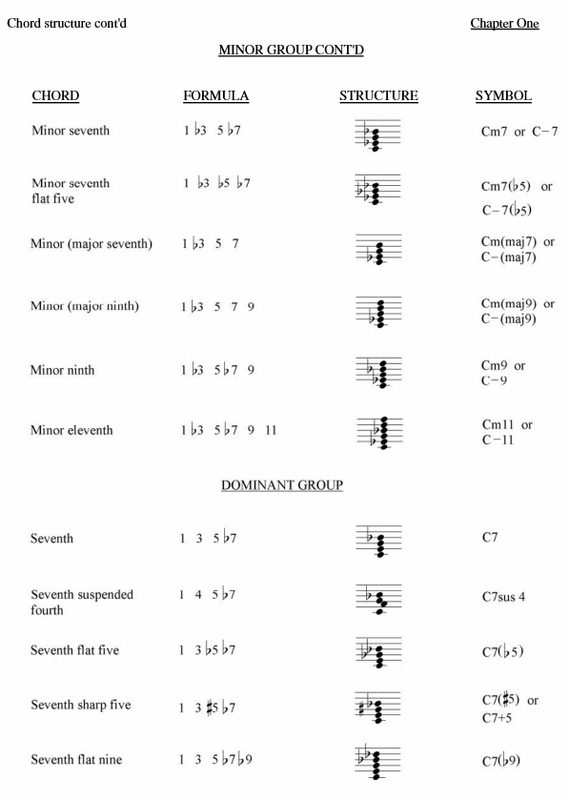 Below is a comparison between a minor seventh chord (m7) and a minor seventh flat-five chord (m7b5). A sharp (#) in front of an interval indicates that it is augmented a half step. A flat (b) in front indicates that it is diminished a half step. * The diminished seventh is derived from a mode whose 7th note is a whole step lower than the 7th note of the major scale. This is called a double-flatted 7th interval. 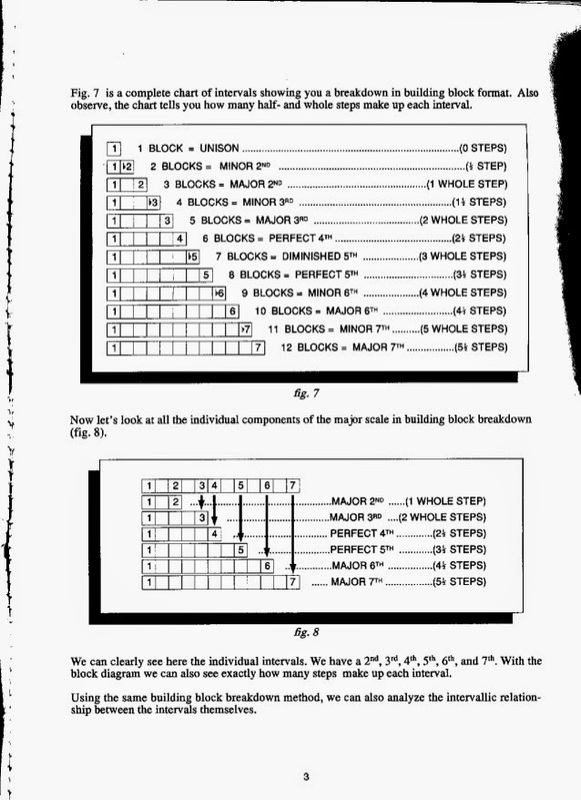 It is equal to a major 6th (4-1/2 steps). An interval is the tonal distance between two notes. This distance is measured in steps. Each interval has a name. For instance, the distance between C and E is two whole steps. This interval is called a major third because it ends on the third note of a major scale. The distance between C and E consists of two whole steps. This distance is called a major third. Conversely, the distance between D and F is one-and-a-half steps. 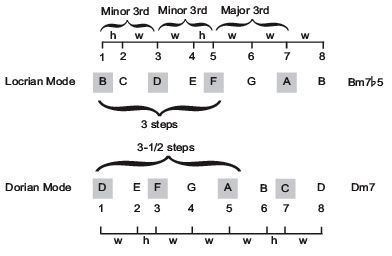 This interval is called a minor third because it ends on the third note of a minor scale, or mode. The distance between D and F consists of one-and-a-half steps. This distance is called a minor third. Intervals that create some confusion are the major 7th and minor 7th (also called a flatted 7th). 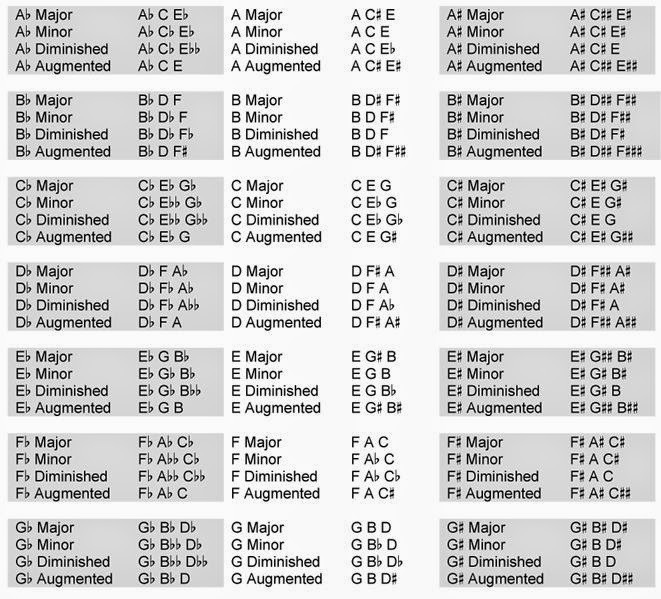 This is because the chords that include them, like the Cmaj7, Cm7, and Cdom7 (C7) look very similar. However, Cmaj7 is a four-note chord that consists of a major 7th interval between its root and fourth note. On the other hand, Cdom7 (C7) and Cmin7 have a minor 7th interval between their root and fourth note. 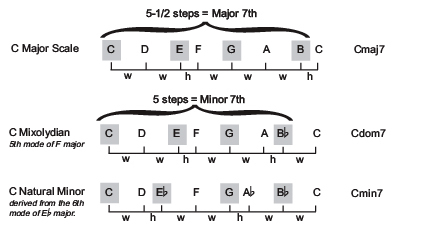 The diagram below shows the difference between the major 7th and minor 7th interval and the chords that result. 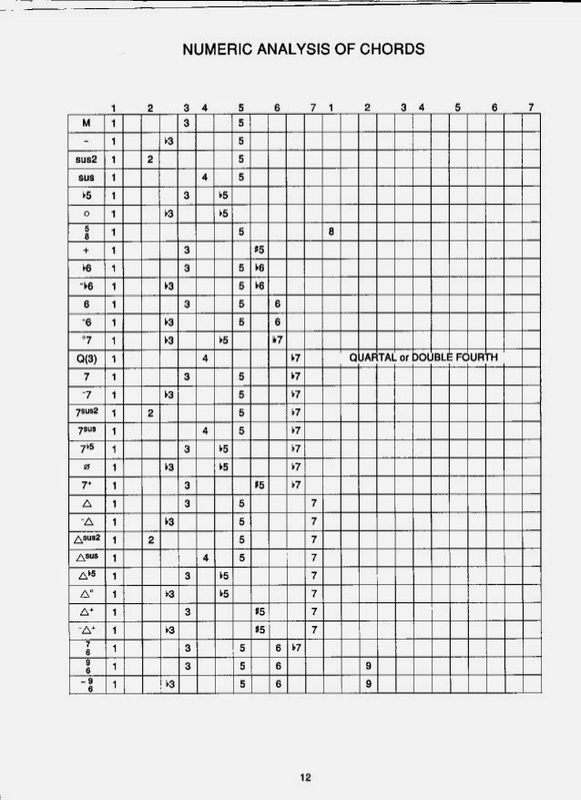 The chart shows the names of intervals and the steps between them. 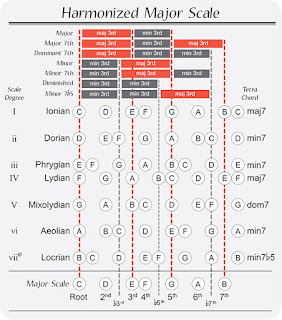 Modes and scales are classified as major and minor depending on the tonal distance between the first and third notes. When a scale or mode has a major interval between these notes, it is called major. When this interval is a minor, it is called minor. The diatonic scale is what all other scales and modes are measured against to determine how we write the interval between the root and other notes. 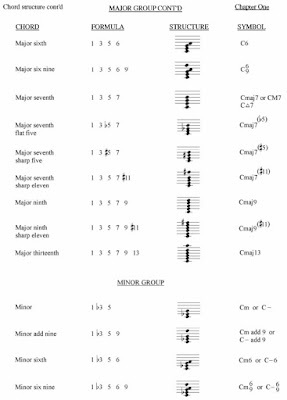 In the diagram below we see the diatonic scale in C major compared to the Aeolian mode derived from C Major. As compared to the Major scale, the 3rd, 6th, and 7th notes of the mode are flatted. 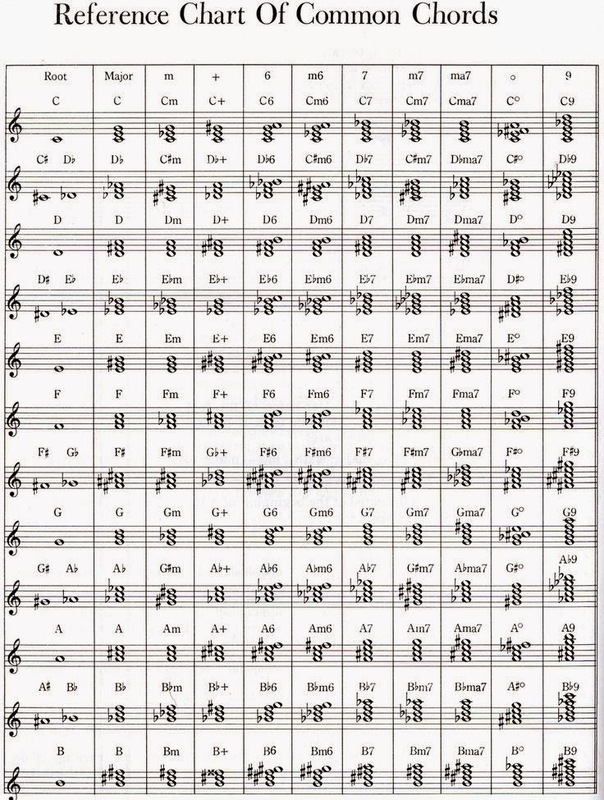 Though the Aeolian mode shares all of the same note as the Major scale, when you measure the distance between the notes using the Major scale as your ruler, you see their differences. 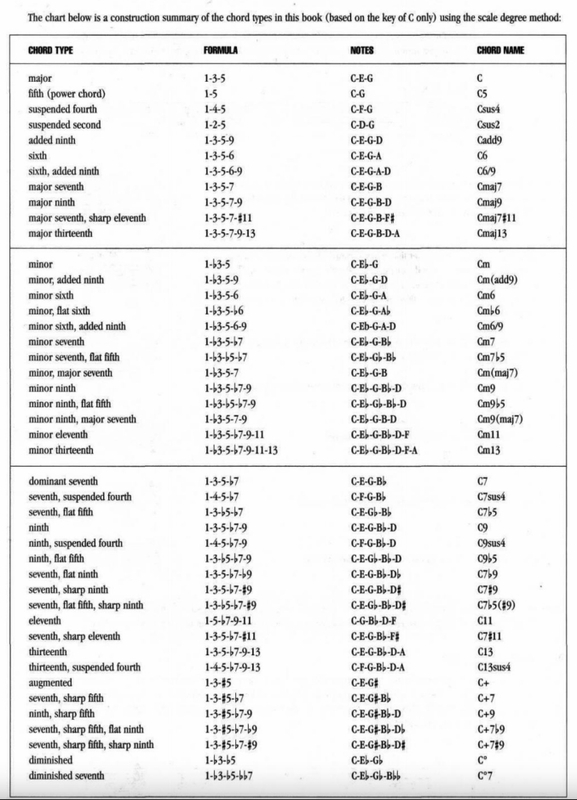 The Diatonic scale pattern is what all other modes and scales are compared against. If a note in a scale is three steps distant from the root that interval is called a diminished fifth (often a flatted fifth) because it is a half-step shorter than the perfect fifth of the Major scale. The above diagram shows how C Major and B Major scale have the same spacing between notes even though the notes are different. The Locrian mode, though it has the same notes as C Major, has notes spaced at different intervals relative to the Major scale. "Gráficos y Estructuras de Acordes y Escalas"
Songwriters and improvisers usually pick chords and scales based in the 12 keys we use in music. This time we will focus on triads, or 3 note chords. These are the basis of Western harmony.The guitar is capable of playing in all of the 12 keys, but for some reason, many guitarists are stuck playing and writing in the basic ‘guitar keys’ of E, A, C, G, & D. But understanding keys isn’t difficult- no more than understanding how to select a pickup on Seymour Duncan’s Tone Chart. Knowing about keys will help you get your ideas across to non-guitarist musicians as well as understand what they are talking about when they say ‘This is in the key of Eb”. And you won’t have to bring a separate guitar tuned down a half-step. Your standard-tuned guitar can play in that key just fine. So lets get busy sharpin’ and flattin’! 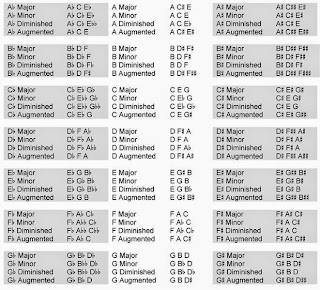 Determining the chords in any key is easy. 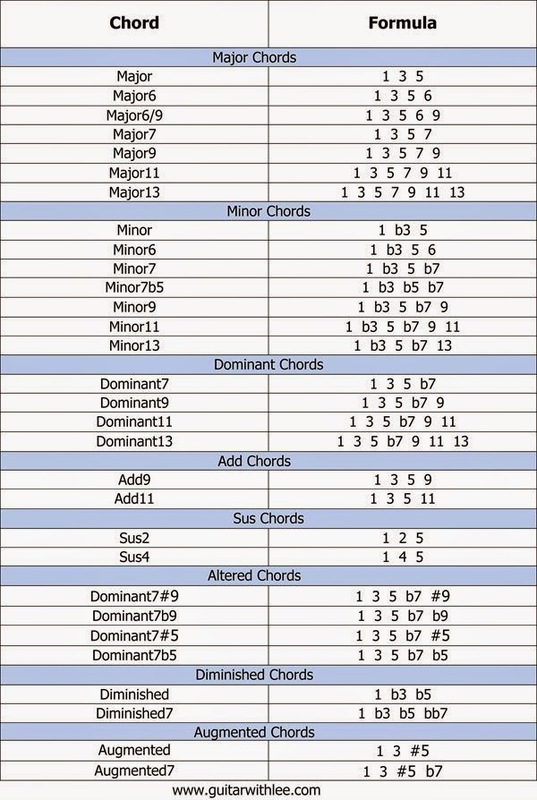 There are 7 basic chords in every key, and we must determine the quality (major, minor or diminished) of each chord. Write out the numbers I ii iii IV IV vi vii in a column on a piece of paper. We use Roman numerals in music to determine the chords. The ‘capital’ Roman numerals are always major. The ‘lower case’ Roman numerals are either minor or diminished. Let’s say you wanted to figure out the chords to the key of A. 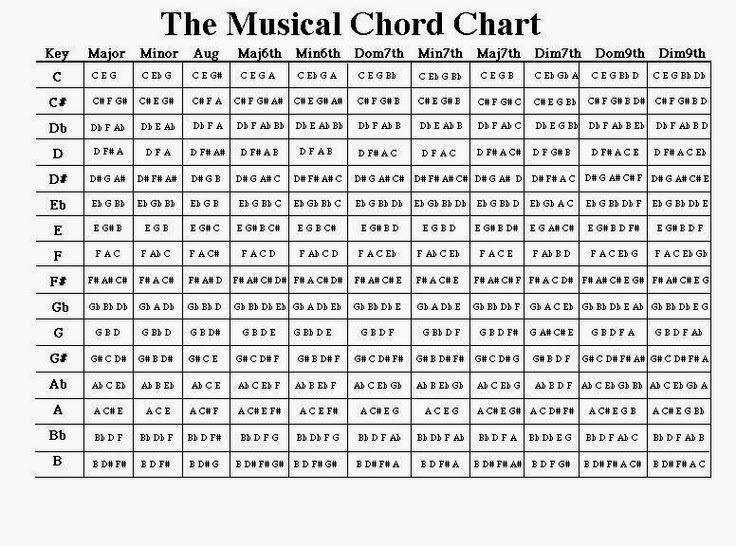 This gives you the 7 chords in the key of A, which you can use in any order to construct a song or chord progression. If there are chords you do not know, you can either ask about them, look them up in a chord book, or look them up online. Coming up with voicings that are unusual will help set your music apart. Remember, these are triads- 3 note chords. You don’t have to use all 6 strings, but you generally have to use at least 3, although they don’t have to be adjacent. If you are playing with a larger band, you can even spread the chords out among the band members- have the bassist play the root, one guitarist play the 3rd and the other play the 5th. They can be in varying octaves as well. Learning the chords in a key is as easy as picking the right pickup. 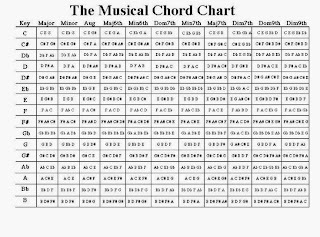 Learning about chords in every key isn’t difficult, and after awhile it is second nature, just like learning to read tab or understanding the difference between an LP or a Strat.